Is it starting to seem repetitive with this onslaught of sax instrumentals that are dominating the release rolls the last few months? Well brace yourselves because it’s about to get even more so as August will see nothing BUT instrumentals being reviewed. Rather than bemoan this however, we need to embrace it because that’s the storyline of rock at this stage due to the unique set of interconnected factors piling up about now and the entire point of Spontaneous Lunacy was to trace rock’s course from the very beginning, wherever it may lead. In the summer of 1948 here’s where it was leading. Paul Williams had of course kicked off this trend last fall and was now reaping the benefits of it with another soon-to-be-hit on the top side of this – Waxie Maxie – but he was now being joined by a parade of other horn blowers as this sound dominated the late summer months. So while it might seem like overkill to include another such example of this movement, one that was the little heard flip to a bigger hit no less, while we’re being buried under an avalanche of similar sounding records, the fact remains that at this particular juncture this was what you heard everywhere you turned as a rock fan – one honking, squealing, grooving, grinding sax blowing after another – and to properly convey the broader atmosphere of rock ‘n’ roll at this time you really need to be immersed in it. Besides it won’t be too many years before this type of record, and Williams himself, fall by the wayside, replaced by the next trend that will take rock in a different direction. When that time comes and Williams’s name no longer adorns these pages, or only gets mentioned in passing every now and then for merely ancillary reasons, and the sax instrumentals are becoming fewer and fewer in number, that change itself has to be noticed. To do that we need to give some sense of how ubiquitous this sound was at its absolute peak. If that means giving an extended look at yet another fairly average record by an artist we’ve already covered in depth, then so be it, because on the late 40’s rock scene Paul Williams’s overall importance can’t be understated, even if his legacy is at constant risk for being ignored altogether. Maybe especially because he’s at risk for that happening. Paul Williams deserves better than that. But then again Williams has been one of the more vexing artists to deal with when it comes to evaluating his place historically because of his overall musical approach. On one hand nothing he plays is ever bad. There’s no clunky notes, no half-hearted noodling giving the impression he’d prefer to be playing to three people in a hip club somewhere rather than honking and squealing to the decidedly low-brow rock masses. But on the other hand he’s been rather conservative when it comes to taking chances. He seems to almost look to avoid the harsher glare of the spotlight, whereas the sax players we tend to get worked up about are doing all they can to stand center stage and bask in the glow of stardom. As a result Williams’s records – while all perfectly listenable – are rarely URGENT. The kind of song that has you clamoring to hear again and again and again. So it’s not surprising that of all the vital trendsetters of rock’s first few years Paul Williams, the father of the rock instrumental, the leader of the sax brigade, the steadily consistent commercial presence that helped ensure this music would have staying power, is always in danger of being cast aside. Here that won’t be allowed to happen, to him or anybody else, even if it means we take another decade or two to get through all of this. So here we are with another similar sounding effort from Paul Williams right down to the fact that this side too was named for a disc-jockey that Savoy Records wanted to curry favor with. Speaking of which, for the record, Spider Sent Me was actually the INTENDED A-side… which gives us a little bit more to mull over and explore. 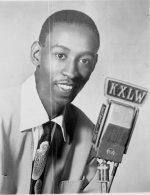 The record was named for Spider Burks, a noted disc jockey who was doing the unthinkable by broadcasting over the air on KXLW. Why? Because it was the late 1940’s and this was St. Louis, Missouri, a city on the fulcrum of the North-South divide. Oh, in case you hadn’t guessed it, Burks was black. He’d gotten his start when a record store manager wanted to sponsor a show to push the type of records he sold and convinced the station to let Burks handle the job. The store saw a huge influx of business, which should only stand to reason since the black populace of the entire city would be apt to tune in to hear for themselves such a rare public occurrence of upward mobility that all in the community were striving for. The station owner was happy because it meant increased ratings and income and so he expanded Burks role there, allowing him to start hosting multiple shows. 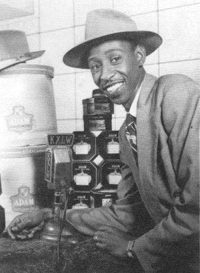 Nat “King” Cole had given Jesse Burks his nickname “Spider” after seeing him play basketball with the active Burks seemingly all over the court at once, but ironically it wouldn’t be Cole’s music, now decidedly pop in nature and appeal, that Burks would be playing over the airwaves. No, Burks was a jazz fanatic, specifically bop, and that would be the music he’d champion, giving it an outlet that oftentimes the more complex and less commercial sound had trouble gaining on the radio. His House Of Joy program would launch with his voice inviting listeners in with the welcoming introduction, “ Good afternoon someone…” as with a warm inviting voice he’d then promise to “climb into your speakers” while spinning the best bop had to offer. The problem is Spider Sent Me isn’t bop. It isn’t even jazz, or jazz-lite for that matter, though Williams certainly had enough of a jazz background to be conversant in it and wasn’t averse to playing it when called upon. But this isn’t it and surely wasn’t going to “fool” Burks into thinking it was. If he DID consent to spinning it a few times it probably was out of a sense of polite obligation more than a musical correlation with the rest of his playlist. His audience meanwhile would have no such sense of obligation or gratitude to consider when they heard it and it’s hard to imagine it connecting with their sensibilities because this is the very type of music which was getting in the way of allowing bop to potentially make commercial inroads of its own. Therefore no matter how you look at it Savoy’s decision to dedicate a song to Burks from their resident rock star was a bet with a decidedly low payoff. But compatibility with that distinct dee-jay and his audience aside, as with most of Williams’s work its still effective in the rock setting it belongs in. Spider Sent Me gives us the Williams we’ve come to expect by now, offering up a steady mid-tempo chugging groove, reliable in its conception but not quite invigorating enough to draw a lot of notice. His problem (as we see it at least) is never due to what he does on record, but more what he doesn’t do, namely give you a sense of wild abandonment in the solos that bring you first to the edge of your seat, then to your feet and leaves you limp and exhausted on the floor by the time it ends. That was the standard his more rambunctious competitors were aiming for and Paul Williams just wasn’t interested in that type of display. But he also doesn’t quite keep you in a trance like the best of the slower groove-oriented sides like Sonny Thompson’s addicting Long Gone had managed. In something like that record, while there was no histrionics to draw your attention, you were so locked in to the main pattern that you couldn’t break free of its spell. Williams seems to try and split the difference, giving you just enough sweaty action at times to pique your interest, but by never letting it get out of hand he’s forced to try and hold your attention with more hypnotic forms of persuasion. As a result it never fully connects either way. The structure is perfectly suitable though, as its smoky stand-alone intro quickly leads into a simple repetitive progression buttressed by the piano giving it all a sense of steady forward momentum while leading nowhere. Almost like watching a train churning along in the distance but getting no further along the tracks, this one just seems to be content to keep the wheels moving even as it otherwise stands still. It’s got a heavier bottom to it that further confirms its rock allegiance, sounding more insistent about it as it climbs the hill before it. He eventually starts to play with increasing intensity, getting close to cutting loose yet he never allows himself to break entirely free. When it settles back into the primary riff to close it out you’re reasonably satisfied but not really transported by what you’ve heard. What Burks heard no doubt was a somewhat crass attempt at courting favor by a label he knew well (after all, Savoy made its name with bop thanks to Charlie Parker’s work). But he must’ve realized right away that the label itself saw him as merely a tool, a way to perhaps bring this new music into a different market, the jazz realm, in the hopes it would be accepted. It’s doubtful Burks was game for it, tribute or not, which may show why the original B-side, Waxie Maxie, with its record store/radio show subject being much more democratic in the material they played and sold, was able to find an audience in the market they catered to whereas Spider Sent Me seemed to fail in that regard. But musically speaking, leaving aside the different audiences they were being asked to satisfy on the air, in the end both sides are pretty close in their merits to our rock ears. The melody here being an ever so slight drop off which accounts for the small difference, but each fit comfortably into the larger picture of rock in the steamy final months of summer. As such both are entirely welcome to adorn OUR playlist, even if neither one jumps out of the speakers in the process. I suppose you could say that two thousand words to reiterate a few basic facts yet again wasn’t really necessary, but the record is certainly worth hearing in its proper context and the story itself is definitely worth telling. Guys like Spider Burks should be remembered, even if his tastes contrast with ours, as evidenced by the fact he increasingly resisted the station’s demands he play more rock as its popularity began to dwarf that of jazz. He ultimately left the station he started with in order to keep playing the music he cherished on the air at presumably smaller outlets until he finally ran out of stops willing to let him spin music that was no longer commercial enough to warrant the airtime. When that day came he left radio altogether and started working to help inmates at local prisons make the transition back into society – a good guy to end, which came all too soon as he died in 1974. If there’s another lesson this review inadvertently showcases it’s that the struggle over the changing of musical tastes wasn’t limited to the more modernly written about white teen discovery of black rock in the mid-50’s and its clash with the mainstream pop that had ruled that market, but rather that battle for dominance was just as prevalent in the community that launched rock from the very beginning. While here we celebrate the style which ultimately “won” those bouts in a commercial and historical sense, we can’t ever forget those which fell by the wayside because one day, like it or not, rock ‘n’ roll and those of us who celebrate it will be the ones left behind. When that happens we’ll hope someone else will show us the same courtesy when looking back to chronicle how it all shook out. 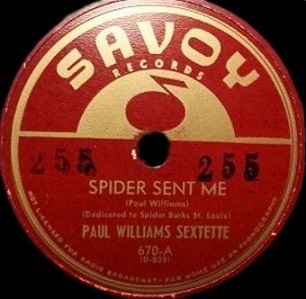 Leave a reply on "Paul Williams: “Spider Sent Me”"